I have officially been spoiled by Cindy of Phat Acre Farm blog. 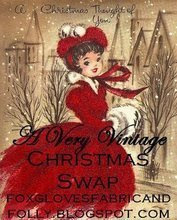 We were swap partners in A Very Vintage Christmas Swap hosted by Foxgloves, Fabric & Folly. This box of treasures actually arrived at my house last week. I didn't let myself open it until I knew she had received hers also. The box was chock full of goodies that anyone would absolutely adore. Candles, candy, napkins, an adorable kitchen towel, handmade soap, cookie sprinkles...well you can see!! That little chinese food shaped box is full of ribbons and tags that are to die for! Thank you Cindy for your sweet generosity. Merry Christmas to you!! Ohhh you lucky lucky lady! Looks like you got a great package. Of course, while here, I just had to listen to that song again. I think it will be my daily thing until Christmas!! Wow! What a great package of goodies! How fun! How on earth could you wait that long!!!! lol lol What a treasure load! I love that candy cane towel...ohhhh I would have been squealing like a sissy girl! lol lol Thanks for coming by and looking at the Burlys! Have a great evening! Wow, you got lots of goodies! Off topic, but...yes, those vines will grow in your zone, they will just have a shorter growing season. They are annuals, so they die with the first frost. Email me from my blog and give me your address (and full name) and I will send you some. My mother in law live in Ok City, and we grow the same plants, hers just bloom later and freeze earlier than mine. Sometimes I feel silly, because some days I feel like I live for the postal lady to arrive! What a fun way to exchange gifts. I just love gifts giving & receiving. What really neat goodies. I love the towel with the candy canes on it, so pretty. What a nice collection of goodies! Enjoy! Hmmmm, you got some good stuff!